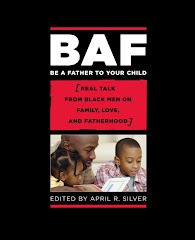 Ms. Silver is a social entrepreneur, activist, writer, and editor of the critically acclaimed anthology Be A Father to Your Child: Real Talk from Black Men on Family, Love, and Fatherhood. The former TV Co-Host of My Two Cents ( on BETJ, now Centric) heads AKILA WORKSONGS, Inc. (AW), a communications agency that services social justice artists, activists, and organizations. Over the years, AW’s clients have ranged from hip hop artist/actor Mos Def to the second largest philanthropic foundation in the country (The Ford Foundation). AW is also known for its popular email marketing service, Put On BLAST! For her opinions and service to the community, Silver has been honored across the country and has been profiled or quoted by CNN, ESSENCE, Time, Newsweek, The Post, Ebony, Jet Magazine, and Ms. Magazine. She also serves as a weekly media panelist for WBAI Radio in New York. Many of her writings can be found at www.aprilisms.com. Silver graduated from Howard University with a degree in English. While there, she co-led the historic student protest of 1989. Afterwards, Silver was elected as student body president. During her administration, she co-founded the country’s first hip hop conference, which birthed the hip hop education movement. As a writer, her essays have been published by the NY Daily News, daveyd.com, allhiphop.com, and other outlets. Silver has also lectured at over 200 venues - from University of Wisconsin to public schools. As an activist, she has founded or co-founded grassroots organizations dedicated to social justice, such as i.e., Co-Motion, HipHop Speaks!, REACHip-Hop, and others.